Crafty birds those pigeons are, very crafty. Pigeons were imported to the United States in the 1600s. Prior to their arrival they bedded in cliffs, hunted and generally lived in small flocks. They’ve traded roofs, window seals and ledges for the rugged cliffs and McDonald’s french fries for prey of the past. The pigeons no longer segregate which has led to the massive ferrel problem. Everyone is a pal. Tonight it’s getting down into the minus single digits and, of course, the wind makes it all the colder. These two love birds found a warm grate and it’s like a magnet, they don’t wander far before returning to the heat. 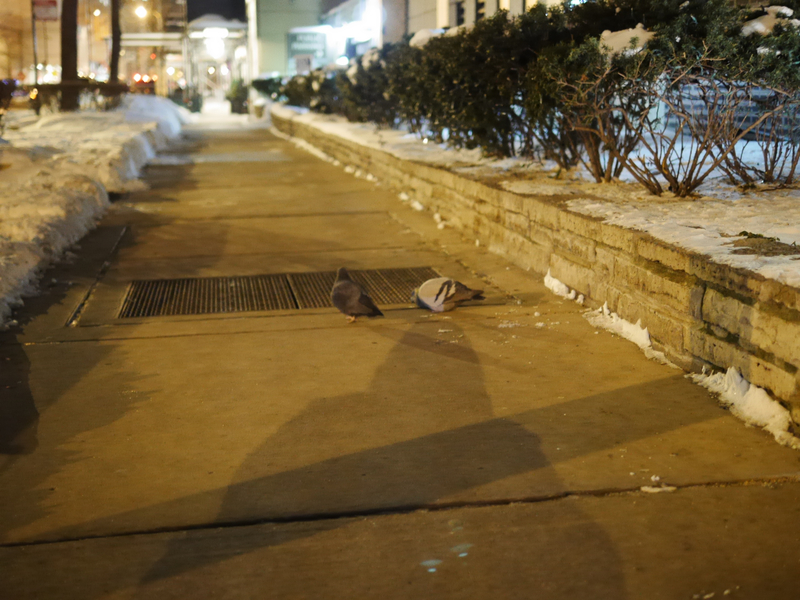 It turns out pigeons can survive just fine in most of the cold mother nature blows their way. I’m not a lover, but I was glad to know these dirty birds can survive. I did find out something that might better endear pigeons to people, they are monogamous often breeding for life.